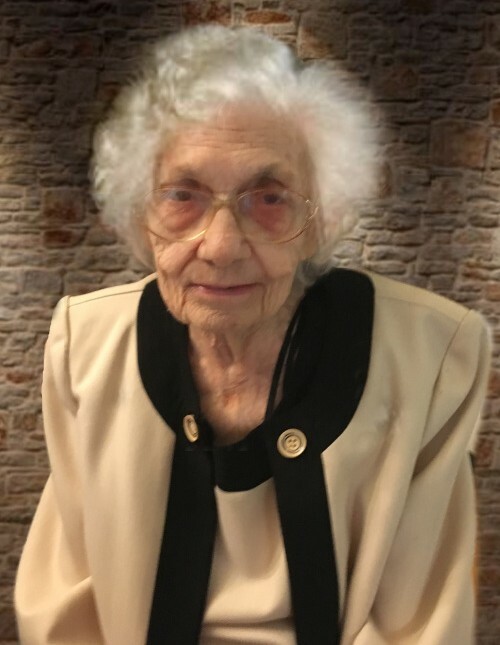 Mrs. Dorothy Mae “Dot” Beard Jackson, age 96, of Rome, GA, passed away on Wednesday, September 12, 2018. A native of Rome and Floyd County, Dot was born on September 6, 1922, a daughter of the late Lewis Auburn Beard and Callie Ann Casey Beard. She grew up in the Floyd Springs area and graduated from Floyd Springs High School. Dot was a member of the Floyd Springs Baptist Church and was a housewife and homemaker. She enjoyed reading, sewing, gardening and was an excellent cook. In addition to her parents, Dot was preceded in death by her husband, Harold E. “Jack” Jackson, on October 13, 2006, whom she married on December 22, 1944. Dot is survived by a daughter, Martha Ann Barker; two sons and daughters-in-law, H. Wayne and Eileen “E.J.” Jackson, and Ronald Burton and Cenie Jackson; four grandchildren and their spouses, Mandi and Timmy Osborn, Brian Wayne Jackson, Tim and Misty Rogers, and Jonathan Jackson. Six great-grandchildren and one great-great-grandson also survive. Graveside and interment services for Dot will be held on Sunday afternoon, September 16, 2018, at 3:00 p.m. in Oaknoll Memorial Gardens with Rev. Frank Wood officiating. The family will receive friends at Salmon Funeral Home on Saturday evening from 6:00 until 8:00 p.m. The staff of Salmon Funeral Home is honored to serve the family of Mrs. Dorothy Mae “Dot” Beard Jackson.